Halvor Torsteinsen Bonsletten (Bonsletten Østerkil) b. 10th March 1855 as the youngest of 9 children on the farm Øvre (Upper) Bonsletten, Østerkil in the municipality of Hegra in the valley Stjørdalen abt. 25 miles to the east of Trondheim, the son of Torstein Pedersen Bonsletten b. 8th Nov. 1801 d. 29th Oct. 1874, married 1833 to Ingeborganna Larsdatter Hjelsvoldsplass (Municipality of Lånke also in Stjørdalen) No further info abt. Halvor/Hallvard. Date of picture: Year not identified. Front row: Halvor Torsteinssøn Østerkil and his sister Margrete Torsteindatter Jacobson. This story is an excerpt of the history of Halvor Østerkil as written by his daughter, Irene Malcom Ostund in 1941. John Røberg was the brother of Halvor Østerkil that accompanied him on the journey to Amerika with John's wife Sara and two daughters Marie and Lina. Insertions of other notes into Irene's story are highlighted in lighter text. Halvor Østerkil was born 20 March 1855 in Stordalen by Trondheim, Norway. He was the youngest to 9 children, 5 boys and four girls. His childhood home was a log house on a farm. However, log houses in Norway were considerably larger than the log houses used by pioneers in America. Halvor Østerkil was baptized and confirmed in the Lutheran faith in Hegre Church, Stordalen. He attended common school until about 15 years of age. From then on he earned his living by working for others, until he was 20 years old when he emigrated to American in 1875. With a brother and his wife and two children (John, Sara, Marie and Lina Røberg), Halvor Østerkil took a boat for America sometime in April, 1875. Their first stop was at Liverpool, England where their party of 50 people was divided into two groups. Here Halvor and his party waited eleven days for a vessel to cross the Atlantic, which trip took eleven days. They landed in New York in May 1875. Then the party came directly west and arrived in Sioux City, Iowa the first part of June. Sioux City was then the nearest railroad center to Dakota Territory to which region this party of travelers were bound. This immigration party consisted of many emigrants. As before stated, Halvor Osterkil's group consisted of himself and his brother with his family. 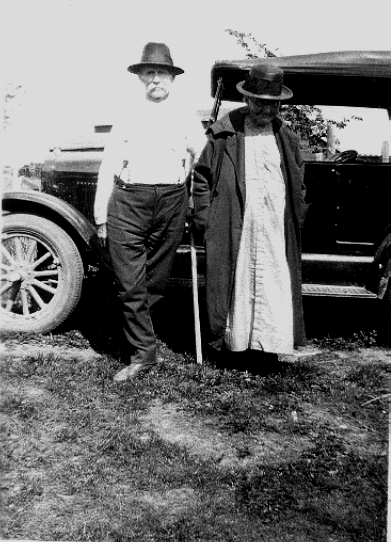 Relatives who had previously come to America and settled in what was to later be Minnehaha County met the newcomers at Sioux City with oxen team and wagon to take the luggage and older members of the party, but Halvor along with the rest of the younger folks had to walk the entire distance to their new destination. So a 3 o'clock on the afternoon they arrived in Sioux City, Halvor and party left the train car an immediately began their 112-mile walk across the prairies northward to their new homes. Halvor's new home to be was 12 miles north of "future" Sioux Falls. They walked every step of the way. During the trip they spent two nights out on the prairie. The first night the travelers made camp someplace south of Elk Point, South Dakota which had been established the year before. They all bedded down right out on the open hillside with nothing but the clear, blue star studded sky overhead. The second night after a full day's travel was spent in an abandoned claim shanty - a sod shanty - a short distance south of Canton, South Dakota. After an evening meal, everyone settled down for a night's sleep. But a terrific thunderstorm arose during the night, lightning flashed and thunder crashed, rain came down in torrents, coming through the roof which had been made of hay and willow branches. Everyone was soaked to the skin. This however did not affect the younger people of the party - but and 80 year old lady (possibly Sara Røberg's mother Maren Pedersdatter Røberg, b. 1795, who accompanied John Røberg's family to America, per the Pioneer History - Minnehaha County Norwegian Pioneers History from the year 1866 to 1896) who was also along suffered much because of the cold and the hardships. Thus, Halvor spent the first two nights in this new Land of Promise - the first night out on the open prairie with nothing overhead but the heaven of blue and the second night with only an open roof of hay and twigs of a sod shanty. On the third day of this journey they arrived at the home of John Blastervold, a relative by marriage, 12 miles north of Sioux Falls. All of the party except for Halvor Osterkil had been sent tickets for the trip from friends or relatives already here in America, but Halvor had saved money for his voyage himself, so as he used to say - "He arrived like Hitler - no one knew he was coming!" Halvor immediately went to work, finding employment at the different farms about the neighborhood. He remembers clearly the winter of the great blizzard of 1880. He remembers how the storm raged furiously for two days - the 15th and 16th of October. He was living with his brother two miles west of where now Dell Rapids is located. The storm was terrific with continuous strong winds and blowing snow, but Halvor says they did manage to get out and feed the cattle but no water could be gotten to them. No horses were owned by settlers there at that time. Oxen were used for work. Many cattle as well as people froze to death during the storm. Halvor himself lost three head of cattle which meant quite a loss to a young man trying to get a start in this new land in those early days. He also told of a herd of 400 cattle or more that had been pastured for summer and had not been taken home yet - that were caught out in this storm and over half of them perished (among them the three head of young stock belonging to Halvor, the young emigrant). After this he worked one summer on the steamboat between Bismark and Fort Benton, Montana (approximately 1300 miles) and also some time between Bismark and Standing Rock (Sitting Bull's old home). This steamboat carried mostly freight and food supplies, the majority of it to the Indians. Halvor remembers that many times on their trips back they brought only buffalo hides and these were shipped back by sports hunters from the East who were hunting down the buffalo fast in those early days. Some of the sports hunters, Halvor said, were English Lords who came over to America to hunt buffalo. He tells of one herd of 4,000 buffalo that were moved down at one time by these hunters. Halvor tells how when the steamboat stopped at the Indian agencies with their food supplies, the Indian squaws would always help unload the cargo while the Indian menfolks stood on the river bank and watched. A steamboat trip between Bismark, North Dakota and Fort Benton, Montana covered a distance of 1300 miles by river and took from 28 to 30 days up and back. During the later part of the summer no trips could be made because of the water level being too low. In December 1884, he went back to Norway for a visit arriving at his old home three days before Christmas. This time he went back especially to get his sister and her family (Margrete Torsteindatter), coming back the next Spring in 1885, bringing with him a party of 22 emigrants who came to make new homes in this new and promising land across the sea. An important incident on this second voyage to America over the Atlantic for Halvor was getting caught in the ice in the North Atlantic. It took 24 hours for the ship to get out of this ice pack. At first they noticed only small amounts of drifting ice but finally found themselves amongst huge icebergs, bigger than any building out on the Dakota prairie. He also recollects that all the time they were in the ice jam and amongst the icebergs, the ship's foghorn was kept at a continual blast which would echo amongst the huge icebergs. He also recalled the intense cold felt while there. The party finally landed at Quebec, Canada and then came over the Grand Trunk Railroad via Chicago to Dell Rapids, South Dakota. Halvor then found work at various jobs - work at the stone quarry and mason work. A memorable winter was that of 1888 when another great blizzard paralyzed life on the prairies. This storm began the 12 of January lasting three days. Much human life succumbed to the elements again, also countless numbers of livestock perished. Halvor tells of saving three human lives which would have perished in the storm if he had not taken them into his home, thawed their frozen faces and hands and kept them until the storm abated. These three men were Welsh paving cutters who had work in the stone quarry located at the edge of town in Dell Rapids, South Dakota and not too far from Halvor's home. The morning of the 12th, being a beautiful day, the three men decided to walk into town and spend some time. They were very thinly clad - no overshoes, mittens nor overcoats as the weather was extremely mild and balmy. In the afternoon about 3 o'clock the storm struck like lightning. The men told of starting home from town but soon discovered they'd never reach their boarding place. They knew of Halvor Osterkil's place on the way and tried to find it, missing it twice. However, the third time they tried, they passed so close to the windows of the house that Halvor noticed shadows and going to the back door to check he found the three men standing there, their hands and faces frozen. Before taking them into the fire Halvor thawed their frozen faces and hands after which they spent the next three days by Halvor's fireside. There was no doubt in their minds but that they would have frozen to death had they missed the house a third time. A school teacher and two of her pupils did freeze to death during that same blizzard. Her school was located about 5 miles from Dell Rapids. These weather conditions (blizzards in winter, hail and rain devastation in summer) along with the grasshopper hordes in 1876 and 1879 are but a few of the hardships and tribulations the early pioneer remembers clearly. The grasshoppers came in such numbers that they would darken the light of the sun as they flew by. They destroyed all growing crops so the settlers were left destitute. Despite all this, hard work, illness and often death took their toll. But with hope for the future, joy, love of life and a faith in God the pioneers survived. In 1905 Halvor and his family moved to Grant County where he purchased and lived on a farm near Troy, South Dakota with exception of eight years spend back in Minnehaha County at Dell Rapids. He lived his last years in the village of Troy, fairly well and quite active. He was 86 years old at the time of this interview and passed away three years later at the age of 89 years. Although he reached a ripe old age he had not escaped illness and suffering throughout the years. Fairly early in his career he broke a leg while on construction work. Because of improper setting of bones in the ankle and foot he was left with a limp and years of rheumatism for the rest of his life. At another time he lost his right eye while blasting rock in the stone quarries at Dell Rapids. In another accident he was severely burned about his body. Misfortunes like these seemed a part of life for the early pioneers. Coming from a stock of exceptionally hardy, industrious and frugal people, he learned early in life to accept what life had to offer and make use of time and circumstances. Halvor Osterkil had always worked had and even in his declining years could not sit still and idle time away without something to do. He had several hobbies that kept him busy after he retired from active work. His wife, Anne, enjoyed making quilts and soon Halvor was helping her by cutting out quilt blocks and often he would be at the sewing machine putting them together. He also enjoyed making articles from wood such as small tables, cupboards, doll beds, pedestals, etc. He liked gardening, tending the flower beds especially the gladiola bed which was his specialty. In spite of his years (86 when interviewed for this report), he was very alert and took a great interest in the affairs of the time. He read books and newspapers and enjoyed the radio. He kept you to the minute on the European War and never missed his favorite newscasts and news commentators.